You want the very best air mattress, right? You want it to be so comfortable that you forget it's an airbed. You most definitely want it to be strong and to support your weight. If you have ever woken up in the middle of a pile of deflated airbed plastic, you will know what we mean. You want an air mattress which inflates easily, and deflates again hassle free. You do not want to pay a huge price, only for it to leak within days or weeks. We have extensively researched the air mattress market to find the very best air mattresses available today. Our buyer's guide is designed to guide you through understanding everything there is to know about air mattresses, and our air mattress reviews are there to make your decision easy. 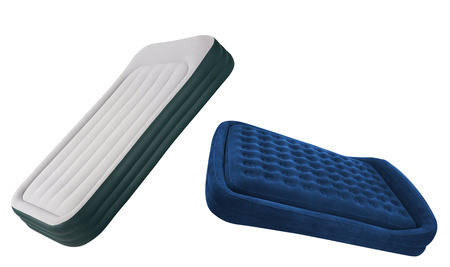 What Are The Types of Airbeds? Raised air mattresses generally have a height of between 18 and 22 inches from the floor. While an air bed should never be used as a permanent replacement for an actual bed, some raised air mattresses have excellent durability and comfort and can be used for extended periods. Most models will come with a built-in pump which will inflate the mattress in a matter of minutes at the touch of a button. Some feature a secondary pump which ensures that the right internal pressure is maintained during the night. This ensures that you don't wake up in a deflated pile of plastic. Internal coils are a standard feature, and provide strength and comfort. The best raised air beds will come with a non-slip bottom to prevent the bed from sliding around the floor with your movements during sleep. Indented sides are also common and they give fitted sheets something to hold on to, making sure that the sheets don't slip. Low profile air mattresses are much more lightweight than their raised counterparts. This makes them much more compact and portable. If you want an air mattress for camping or to take backpacking, this is typically what you would choose. They are generally filled with air using either a manual hand pump or an external battery powered pump, and can be filled relatively quickly. Being smaller in size, these air beds are generally cheaper than other styles. They are often also used at home but are more suitable for short term sleeping arrangements, such as for guests staying just a couple of nights. They are perfect for kid sleep overs! Air mattresses that come with a frame add a touch of comfort to your sleep. By raising the mattress, you are less likely to get cold during the night as the cold temperature from the floor or ground won't transfer to you. This makes them especially ideal for camping where you are more exposed to the elements. Instead of lying directly on the cold earth with just some tarp or tent flooring to keep the cold out, you can protect yourself. An added benefit when using these air beds for camping is that you have some extra storage space under the frame. We all know how cramped tents can get with all your gear! Some air mattresses with frames even come with built in side tables which is a nice touch. Overall, having a framed air mattress just gives you a bit more comfort. If you don't want to splurge for the cost of a raised air mattress but don't want your guests practically sleeping on the floor, these are a good compromise. Generally used for lightweight camping trips, backpacking or as an emergency backup, air pads are low cost and very compact. They are far less comfortable then an actual air mattress, but do have the advantage of being very easily transported. They feature compression straps and can be rolled up into a tight roll. They do not require a pump and as the name suggests inflate by themselves. All you have to do in unroll them. Some come with an inbuilt pillow, and they come in various thicknesses ranging from 1 to 3 inches. An air mattress should never be considered as a permanent replacement for an actual bed. They can however be used for extended time periods. If you are using one every night for a few weeks or months at a time, you definitely need to consider the long-term comfort and durability, as well as ease of use. The best air bed for daily use is of the raised variety because they provide the best support. They feature internal coils which just like in a real mattress will support your back while you sleep. This also makes them the most comfortable. If you want added comfort and support you might consider a memory foam air mattress. An alternative to using a raised air bed is to use an airbed with a frame. These give you height of a normal bed, however will not be as supportive or comfortable in the long run. Read air mattress reviews very carefully when looking for such a product. When finding the right air mattress for guests, you want to consider reliability, comfort, storage size and ease of pumping up. Unless you have guests over every night, you will want a reliable airbed which you can easily stow away for weeks or months without having to worry about whether it will pump up and function as it should when you need to use it. You don't want your guests to wake up in a pile of plastic either so you need to make sure you are purchasing a highly quality product. The the best air mattress for guests will be either fast inflating raised or low profile air mattresses. When it comes to choosing an air mattress for camping, it will largely depend on the kind of camping you intend on doing. If you are a luxury camper or have an RV, you can use a raised air mattress with a built-in pump. It will however require a portable generator for inflation. Most people will prefer a more basic option for camping. A camping air mattress should be lightweight, easy to carry, easy to set up, and reliable. The best types of airbeds for this are low profile. Easily the most portable, they are light and simple to use. For the little ones you can choose between low profile or self inflating air mattresses. Both are easy to inflate and can be stored away without needing much space. Generally you would choose a low profile air mattress because they provide much more comfort, but the self inflating variety can make a good option also. Being so easy to use and lightweight, you can easily pop them in the wardrobe or under the bed and have them as a backup for emergencies or for sleep overs. One of the ​considerations to make when deciding on an air mattress is the style of pump you prefer. Different air mattress require different amounts of air, and generally the larger ones will come with a built-in pump. The low profile variety will usually come with either a battery powered pump, or will require manual inflation. Some air mattresses will come with an included external battery powered pump. While not as quick as a built-in pump, these make life a lot easier and give you a lot of convenience. Generally speaking the premium low profile and framed air mattresses will come with an external automatic pump. The other type of external air pump is the manual variety which requires time consuming and physical work to get the air mattress inflated. Usually the smaller air beds will use these pumps. While more physically demanding, they have the advantage of not requiring any power source. While more time consuming and less convenient that a built-in pump, external pumps do have an advantage. They can be more easily replaced or serviced in the event they malfunction as compared to built-in pumps. The larger raised air mattresses generally come with a built-in pump which automatically inflates and deflates the mattress at the push of a button. If you want an air mattress which will be used often for guests or as a temporary replacement for an actual bed, a built-in pump is a must. Without one you will have to work hard every time you need to inflate the bed. Some premium air beds come with a second built in air pump which maintains the internal air pressure while you sleep. This is a huge plus because it ensures the correct level of support and comfort is maintained all night. It also makes life a lot easier because you don't need to get out of the bed to push the button to re-inflate the mattress. Since entering the market, SoundAsleep has quickly established itself as a serious player. At a price considerably lower than what you would pay in a major store it delivers a far superior product. It is no wonder that the customer feedback is so overwhelmingly positive. In many cases, this best air mattress has exceeded customers' comfort expectations. The top feels like a microfiber material and is very soft. The internal air coils provide the kind of support you would expect from a regular bed. While if you sleep alone (and on the side of the bed) there may be a slight tendency to roll towards the middle, with two people laying side by side the surface remains flat. Keep in mind that when first purchased, the mattress will stretch slightly over the first few nights. This is totally normal. One of the best features is the user-friendly pump. At the push of a button, the mattress will either inflate or deflate in under 4 minutes. It could not get any easier. You should be aware that although according to SoundAsleep the mattress is queen size, it is actually a bit smaller than a queen. The dimensions are 78 x 58 inches, while a queen dimensions are 80 x 60 inches. Not a huge difference, but perhaps a bit misleading. There is a history of occasional defects, with some customers being disappointed by the product they receive. However, these instances are very rare. In addition, the air mattress comes with a 1-year guarantee and customer service that has been called "unparallel" by customers. So you know that you are making a risk-free purchase. This air bed is sure to impress. We have no hesitation in recommending it and know that you will love it. Given the high demand for air mattresses these days, it's no surprise that there is hot competition for the best air matress. This Insta-Bed is very similar to the air mattress by SoundAsleep and is another sound choice. Unlike its competitor, this airbed comes in twin and queen sizes. It also comes in various styles including with a headboard, and with a pillow top for added comfort. The best feature about this air mattress is the second "Never Flat Pump" which maintains the desired internal air pressure. Basically, as the air mattress loses air during the night (it's very normal for this to happen), this pump quietly adds extra air so that the comfort level stays the same. If you're wondering if it is loud enough to wake you up, the answer is no. Many customers have left reviews commenting on the fact that it never once woke them up. In addition, the air mattress features a fast and simple one-touch inflation and deflation which takes just 4 minutes. What we really like, is that you have the ability to choose from three different comfort levels: firm, medium and plush. Who knew an air mattress could be so high tech!? A commented on feature which is appreciated by customers is the height of the bed. At 18 inches it makes getting in and out easy for those who would otherwise have some difficulty. If you have elderly relatives coming to visit, you can relax knowing they will not have a problem with the bed. At a very comparable price to the SoundAsleep air mattress, this is another high value airbed which you will not regret purchasing. Want more air mattress reviews? Click below. The deluxe air mattress by Intex is priced cheaply at less than half of what you would pay for either the Insta-Bed or SoundAsleep airbeds. At the price, it is definitely good value, especially if you need an airbed for occasional guest visits or short-term use. However if you are looking for a longer term solution, this is probably not the best option for you. First the positives. Other than the low price, it has some desirable features. The pump is built in and easy to use. The mattress will inflate or deflate in approximately 4 minutes. It has a very solid feel and is comfortable. The perimeter is raised slightly, especially at the head, to provide extra head support. In other words, you could get away with not using a pillow if it's just a couple of nights here and there. The upper chamber is also indented which makes fitted a sheet easy, and the surface fabric is such that the sheets should not slide around. The problem with this air mattress is that the quality is not super high. Many customers experienced durability issues after a few months. The seams begin to disintegrate, leaving uncomfortable bulges in the mattress. It seems you get what you pay for. As a result, this air mattress is not particularly suited for long-term use. However, if you want a lower priced option and expect to use the airbed for just the occasional guest visits here and there, or perhaps you need a temporary bed solution for a couple of months, this would make a good choice. Overall the customer feedback is positive and for the price, there is some good value here. This is another air mattress which is very high value. The price is on the higher end, but what you get is some seriously heavy duty. Made out of very thick vinyl, you do not have to worry about punctures or other defects. In the unlikely event that it comes with a defect, the 90 day warranty has you covered. There are a couple of standout benefits this air mattress has over its competitors. Firstly, the top layer is a special chamber which distributes air flow across the whole area of the surface. This not only adds comfort, but it creates extra strength which will keep the bed top flat. This means you are less likely to roll into the middle of the bed. The other highlight is that it is taller than the other airbeds. The queen and king size are both 25 inches tall and the twin is 20 inches tall. This makes it the perfect choice for those who have trouble getting in and out of bed. If you have elderly parents who visit a lot, they will really appreciate this. The other features are all as you would expect from the higher price. It inflates and deflates quickly and easily using the built-in pump. It even comes with a second value so you can manually add extra air with a secondary pump if you have one. This allows you to tweak the firmness easily. Once inflated, the air mattress will stay inflated. If you want a long-lasting, high-quality airbed, this product requires serious consideration. It is strong enough to be used for longer periods at a time, and according to many customers just as comfortable as a regular bed. We have no hesitation in giving this our full recommendation. If you are reading these air mattress reviews and thinking you want some added luxury, this AeroBed is the solution. With its headboard and high comfort, you will enjoy sleeping on it for months at a time. Perfect as a temporary bed or for guest visits, many customers have comfortably used it for extended periods at a time. Some have even used it camping for the ultimate in outdoor luxury. At 18 inches tall, this airbed is not as tall as some of its competitors. However, the reinforced edges make getting in and out of the bed easy. You can sit on the edge as you would on a regular bed. The headboard not only gives you something to rest your head against, it also prevents pillows from sliding off the edge of the mattress.This is a common problem with other airbeds. Together with the easy fitting of sheets, the headboard gives the feel of a regular bed. The bed is inflated using the easy to use built-in pump. When you first use the mattress, you will notice that the airbed seems to deflate over time. This is due to the stretching of the plastic. It is normal with all new airbeds. You will need to top up the air occasionally over the first few days. Once fully stretched, the bed will stay firm. There are some instances of customers receiving defects when purchasing this air mattress. This is however very rare, and the majority of customer feedback is very positive. Some have owned the mattress for years and have used it for months at a time with no problem. This is a strong contender for the best air mattress. At a fraction of the price of other raised air mattresses, this Intex airbed is a bargain. Perfect for extended home use, as an occasional guest bed, or even camping, it provides versatility and a lot of value. The air mattress comes with an internal pump which easily inflates the mattress in under 4.5 minutes. What we really like, is that you can also attach an external battery operated pump. This allows you to use it not only at home but also when camping. As with all air mattresses, it will stretch over the first few days. It is recommended that you follow the product guidelines, and give the mattress some time to stretch before using it extensively. With a high profile of 22 inches, it will make the perfect guest bed for elderly relatives. Getting in and out of bed will be easy. The air bed is strongly made, with thousands of polyester fibers providing great support. From the air mattress reviews, many customers have enjoyed this airbed so much that they have called it the most comfortable airbed ever. Being able to easily use sheets due to the side indents, it will feel just like a normal bed. For the price, you will not find a better deal than this airbed. We recommend it highly for its versatility, low price and comfort. This air mattress is perfect for those looking for an inexpensive guest bed that can double as a camping mattress. The price is low and as long as it is used for short periods at a time, there is a lot to like about it. Sized as a queen, you will comfortably fit two people on this airbed. Queen sheets fit easily, and as long as they are fitted sheets will stay on the bed thanks to the side bulges. The mattress stands 16 inches tall which while twice as thick as a standard mattress is far less than the more expensive options which are generally at least 20 inches tall. If you need an airbed for elderly guests who have trouble getting in and out of bed, this will not work for you. This airbed does not come with a built-in pump. It requires a battery operated external pump which you will have to purchase separately. This does however give more flexibility as it is lightweight, and can be rolled up for easy transport. In terms of camping air mattresses, this is a good option. It will keep you high off the ground and as long as you place a comforter or similar between you and the bed surface, will keep you warm. The airbed features internal coils which not only give it strength but also increase the comfort. While suitable for camping and short term home use, the quality of this air mattress is lower than its more expensive competitors. If you want to use this mattress for a few nights at a time, it will meet your requirements. However if you need a longer term solution, and intend to use the air mattress for weeks or months at a time, then we do not recommend this product. For long-term/permanent use, spend slightly more for either the SoundAsleep, Insta-bed or Fox airbed. As an alternative to a raised or low-profile air mattress, this frame airbed has the massive advantage that it raises you off the ground which is perfect for camping. By doing so, not only does it provide you with a huge storage space, but it will keep you much warmer. When camping there is nothing worse than lying directly on or near to the cold earth. While most customers find it to be rather heavy, as long as you do not need to hike or trek to the camping area, the mattress is very portable. It can be folded away and comes with a convenient bag. Once at the camping ground, the included battery operated pump will fill it in around 5 minutes. A good idea is to fill it immediately once at the destination and lay on it for a few minutes. This will allow it some time to stretch. You can then top it up before going to bed to maximize the comfort and support. While the customer feedback is mostly very good, with many people saying it is the most comfortable air mattress they have ever used, there are some negative comments which should be considered. This best air mattress is made from a plastic material which according to many customers makes quite a lot of noise during the night as you move in your sleep. This can be reduced by topping up the amount of air just before you go to bed. The fuller it is, the less it should move and therefore make noise. Some customers found the airbed to be less comfortable than they had hoped. According to these air mattress reviews, the metal ridges from the frame can be felt making sleep uncomfortable. These comments are however in the minority, so it is possible that they just didn't have enough air in the bed. While primarily used for camping, this air mattress is also very convenient to have at home for when guests come to visit. It is not ideal for long term use, but for shorter periods will work just fine. With the versatility of giving you both a spare bed at home for guests and a camping air mattress, this framed airbed is a good purchase. As far as low profile air mattresses for camping go, this is the Cadillac. The mattress itself is high quality and comfortable, but what makes this airbed standout is the external rechargeable pump and the outstanding customer service. First the pump: Not only can it be pre-charged at home before you go camping, it can be charged using the car DC outlet. This gives you the convenience of being able to charge it at the camp site easily by using the car power. Or if you forget to charge it at home before you leave, you can charge it during the drive. Many customers have said that SoundAsleep's customer service is incredible. If you call them, you can expect to be put through to a real person who will talk you through everything you need to know. If there are any product issues, they will quickly and painlessly help you resolve it. This together with the 1-year limited warranty makes this camping air mattress a very wise choice. All the other features are what you would hope for in a great air mattress. It inflates quickly in under 3 minutes. Once inflated, it will initially stretch slightly and will likely require some topping up. It is very comfortable and has been specially designed to meet the more rugged demands of camping. With the carry bag, you can easily bring the air mattress with you wherever you go. Whether you want an air mattress at home for slumber parties or the best air mattress for camping, the SoundAsleep Camping Series has to be your first pick. It comes very highly recommended. This camping air mattress is very popular with customers due to its price, its portability and its strength. The most commented on positive aspect of the airbed is that it holds air very well. Most airbeds will leak, but this product appears to be almost leak-proof. It is very lightweight and can easily be carried with the included bag making it perfect for camping. Some customers have commented on the fact that the bag is overly large. This can be both positive and negative. It means you can fit the mattress inside easily, but it will feel clunky. Unlike most air mattresses, the surface has no flocking. This means that it is potentially less comfortable, however, it is more sanitary. If you spill something on the airbed, it can be easily wiped clean. While most customers have not complained about discomfort, some have said that it feels a little like a waterbed if not completely full of air. This is a potential drawback, especially if you shared the mattress with a partner. You may feel every move they make throughout the night. Overall this air mattress receives dominantly positive customer feedback. For the price it represents great value for those looking for a camping air mattress. There is a lot to think about when it comes to choosing the best airbed. With so many different types and brands, it isn't easy. These air mattress reviews are the result of our extensive research into the market. We feel confident that any will live up to your expectations. We hope that you can find your best air mattress, and can enjoy it for as long as possible. If you have read this far, thank you. We would love to hear from you. Please feel free to leave a comment below.